Hairspray is all about BIG hair and lots of hairspray! Hairspray review of Lowestoft players’ show at the Marina Theatre, Lowestoft in June 2017, published in the Lowestoft Journal, 9 June 2017 and also the Eastern Daily Press. Hairspray is one of those unlikely stories that became a big hit on film and stage. And big is the word. Lowestoft Players take the tale of oversize love triumphant in the cut-and-thrust of showbiz TV in early 1960s racially segregated USA and give it their special high energy, fun-packed treatment. Pace never slackens. Songs hit one after the other, with familiar Good Morning Baltimore, Nicest Kids in Town, I Can Hear the Bells and the standout I Know Where I’ve Been keeping everybody’s feet tapping. Cool choreography, smart direction, verbal and physical gags, rousing singing and a piece of social history with a message make a storming show that never takes itself too seriously. 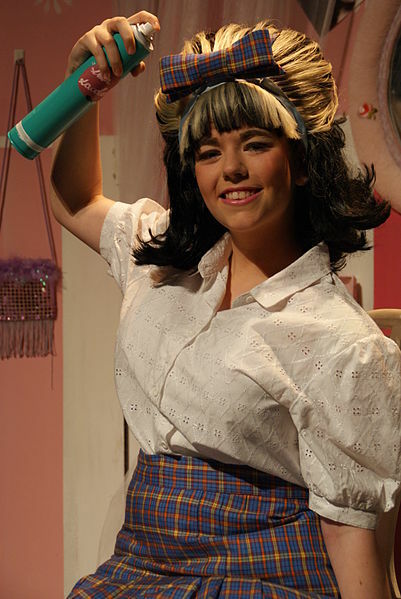 Bethany Lewis as the large Tracy Turnblad is knockout and supported by a superb cast of characters, cameos, amusing faces, bodies, costumes and quirks that make for a feast of a night out. PS: Only once I’d written and published it did I notice how similar it is to my own review of a different company production of Hairspray in Norwich 2014! Oh well.